HOMANN HEIRS. -Dominia Anglorum in America Septentrionali. HOMANN HEIRS. - Dominia Anglorum in America Septentrionali. Dominia Anglorum in America Septentrionali. - HOMANN HEIRS. Title : Dominia Anglorum in America Septentrionali..
Map maker : HOMANN HEIRS.. Size : 19.8 x 22.0 inches. / 50.3 x 55.8 cm. 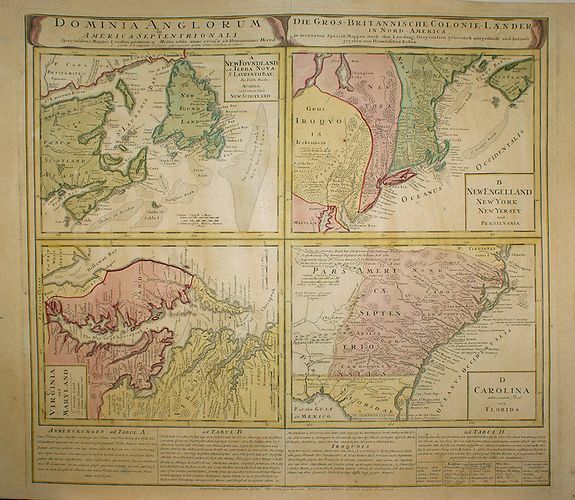 Description :Four maps on one sheet (New Foundland/ New England/ Virginia and Carolina/Florida) based on J.B.Homann's map, showing British possessions in North America. At bottom of the sheet text in German relating to the areas depicted. Condition : Paper slightly browned., printer\'s crease in lower right corner, else in good condition.